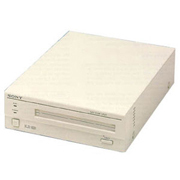 **Refurbished** Sony 5.25", 5.2 GB, Magneto Optical drive--branded retail kit. External MO drive with 4 MB cache and SCSI interface. Fully backward compatible: reads & writes 2.3 GB through 5.2 GB MO disks; read-only 600 MB through 1.3 GB MO disks.